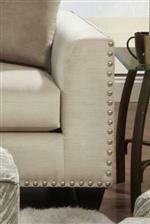 Nailhead trim adds sophistication to this sofa. Flared arms and loose back cushions offer contemporary style, while overall the sofa showcases bronze and silver tones for glam vibe. Four large 20-inch pillows add softness and comfort to complete its design. The 1460 Sofa with Flared Arms and Nailhead Trim by Fusion Furniture at Wilcox Furniture in the Corpus Christi, Kingsville, Calallen, Texas area. Product availability may vary. Contact us for the most current availability on this product.